Guildford is one of the brightest young talents in New Zealand rugby who shared in his country's Rugby World Cup success in 2011 and has now got his career back on track following a public battle with the bottle. He made his provincial debut for Hawke's Bay in 2007 aged just 18 and made an impact at Super 14 level with the Hurricanes during the 2008 season which drew comparisons with legendary All Black Christian Cullen. In 2009 he was a focal part of the New Zealand side that defeated England in the final of the Junior World Championship in Tokyo but tragedy struck his family when his father died in the stands following the game. 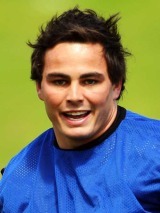 He signed with the Crusaders for the 2010 Super 14 season before another successful domestic campaign in 2009. He was selected for the All Blacks' end of year tour as a result and subsequently earned his first cap against Wales at the Millennium Stadium where he produced an assured display that was followed with another against England. He brought the curtain down on a notable year with an appearance against the Barbarians and was later named the Maori Player of the Year at the New Zealand Rugby Awards. After being picked for the Sevens side for the 2010 Commonwealth Games, Guildford had to fight hard to get back into All Blacks reckoning. It was something he achieved after he impressed throughout the 2011 Super Rugby season and come the Tri-Nations Guildford was back in the international fold. Head coach Graham Henry picked Guildford for the World Cup later that year ahead of the likes of Sitiveni Sivivatu and Hosea Gear but his tournament was almost over before it had begun after it emerged that he had a drinking problem. Guildford admitted to having issues with alcohol as details of incidents in Auckland and Brisbane during that year's Tri-Nations came to light. He met with All Blacks management who chose not to ban him while the player promised he would take steps to control his drinking via a 'self-improvement programme'. Guildford did not feature in the All Blacks' opening three games of the tournament, prompting speculation that he would see no game time at all. However, he was handed a start against Canada in New Zealand's final pool game and took his chance to shine in fine style, helping himself to four tries in a stunning individual display. He did not feature again in the tournament and watched from the stands as the All Blacks claimed the sport's biggest prize. His drinking woes resurfaced a few weeks after their triumph though when the winger at the centre of a drunken assault claim during a holiday in the Cook Islands that made headlines across New Zealand. Guildford once again apologised for his actions and sought help to deal with his problem. Since getting to grips with his drinking at the start of 2012 he has returned to his best form. He played a key role in the Crusaders march to the Super Rugby semi-finals and scored eight tries on their way to the last four. His form caught the eye of new All Blacks head coach Steve Hansen and he played in the first two Tests of the series against Ireland for his first caps since the World Cup win over Canada.